COLOR WATCH: DARK ROOMS – PITCH BLACK AND NAVY BLUE WALLS ARE BACK! You know how I always say I love a room with white walls? No doubt. My preference. Absolutely. Is it possible that I could also love equally as much a rooms with dark walls? Rich black walls or enchanting navy blue wall paint (sometimes with a little gloss) always works for me. Loving the black kitchen above with the dark cabinetry, the cobblestone like paver field tiles used on the floor, the white beadboard ceiling, the farmhouse table…everything about it. The wonderful sultry baths below also work for me. It is weird…even though these spaces are dark…they seem bright to me…is that possible? Even cheerful! Hmmm….interesting. Maybe it is the fact that each of these spaces has either white ceilings, molding or a light floor or accent wall added in for contrast – two toned rooms. Love them! What do you think about rooms with dark paint on the walls or cabinets? Work for you or not? P.S. It is raining again here in Los Angeles. I have no home phone service due to the rain…it has been out for a week! Arghhhhhhh! Help. I hope you all on the east coast are surviving the weather! I think the dark colors on the walls work pretty well, and by having bright colored furniture it really makes everything pop. Coco I love the drama especially with white! We have alot of dark walls here and we enjoy them. I think it also depends on the climate and light that you live in. So gorgeous, I always have loved deep dark colours. Actually so natural and neutral, stunning. I am thinking of painting my 12 year old son’s walls an inky dark blue. I think with the right accents (crisp white and pops of red) it could look warm and cozy. I am always amazed how crisp & fresh our black room feels – even in the heat of Palm Beach.It is totally gloss black with white furniture.The trick is keeping it free of clutter. Love the look. I’m also a huge fan of white walls and rooms furnished in various shades of white. 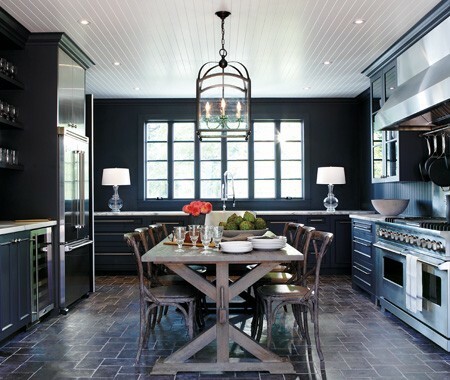 I must say that I’m all kinds of crazy about this kitchen in shades of charcoal. The expansive white ceiling, broad window and pops of stainless add just enough light and reflection. It has such a wonderfully soothing feel. Love these rooms. They especially work because of the light and the contrasting light color and/or texture of the floors and stainless steel. So restful and cozy! Makes me want to redo my kitchen. I agree with you that the contrast of the dark colors with the dramatic pops of white do make these spaces incredibly cheerful! Too much dark can make a room feel drab and dreary, but all of these spaces have been expertly-executed and feel nothing but inviting! Thanks for sharing the photos! That bathroom with the clawfoot tub… Oh my God. Love industrial accents. Haven’t really seen them in bathrooms much, so this was exciting! I love it, especially with large windows and bright white trim! I have been thinking about painting my cabinets a dark rich grey b/c I really don’t like that the stainless steel appliances make the statement in my kitchen..I want them to blend in with the cabinets! I do love Navy. I think it takes a strong person to do a dark color like that. I’m a chicken, I’ll admit! gorgeous. i love the simplicity of the second last room. These rooms show great creativity! 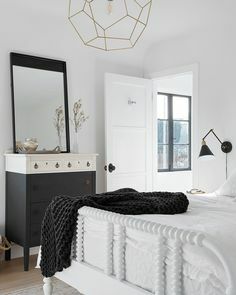 I have never thought dark walls can look so cosy with white ceiling. The bathroom is extremely nice, congratz! I LOVE the idea of black walls, these pictures show how beautiful and dramatic they can be. I just don’t know if I’d be able to live with them in my own house…I like to keep things light and bright. 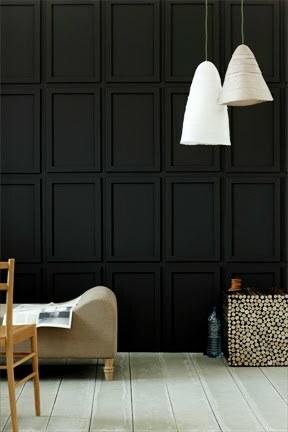 Black is truly a strong color for 2011 and has always been a staple in every room. How bold can you go!!! I am a huge lover of navy blue walls. I did my son’s room in navy and white…love it lots! Great post…gets people to think out of the box! Happy new year! Love it. Contrast is so appealing. Coco, I just wanted to say I love your blog. Now, on to your question. I like dark painted walls and cabinets because it adds a since of elegance and mystery. My challenge is that I am from New York and currently live in NJ close to NY so I have always lived in small spaces that some how need to appear bigger therefore I have not tried this yet. I hope to one day. I have become obsessed lately with dark colors and studying how to make them work even in the smallest of spaces. Love this post!